The pigmentation and staying power that you love about your favorite makeup products become frustrating when they end up on your carpet. As with any stain, different types of cosmetics require different treatment to remove makeup from carpet. Tackling the mess fast with the best cleaning products and tools can increase the chances of removing the stain fully. Review the care instructions from your carpet manufacturer, or test the cleaning solution in a hidden area before you proceed. If the dye in the fiber fades or changes colors, try a different method. After you treat the carpet with a water-based product, fill a spray bottle with clean, cool water and spritz the area lightly to rinse it, blotting up excess moisture and residue. When powder blush, eyeshadow and finishing powders shatter or spill, clean the stain immediately. The longer the powder sits on your carpet, the more likely the stain will spread or set. Start by removing as much of the powder as you can before you use any cleaner. Hold a paper towel directly next to the spill and gently brush the excess onto the towel with a butter knife. Mix 1/4 teaspoon of mild, clear dishwashing detergent with 1 cup of lukewarm water. Wet a white cloth in the solution, and blot at the stain gently, working from the inside of the stain out. Wait a few minutes, giving the detergent time to break up the stain, and then continue blotting until the mark lifts. Use a clean portion of the rag each time you dip into the cleaning solution to keep the color from transferring from the rag back onto the carpet. Cream blushes, lipsticks and similar products typically have an oily base that helps moisturize your lips or skin. This base blurs fine lines and prevents dry flakes, but it also clings to carpet fibers, making it difficult to remove makeup from carpet. Remove any excess product with the back of a butter knife, and then mix 1/4 teaspoon of white distilled vinegar with 1 cup of warm water. Blot at the stain, removing the outermost portion while applying the solution to the carpet fibers. Wait for a few minutes before blotting again to give the acid in the vinegar time to break down the creamy makeup base. If you can still see the stain, place a white paper towel over the spot and heat your clothing iron to the lowest setting. Iron over the towel briefly, and then check the underside of the towel; the stain should transfer. Repeat this process until the stain disappears. Products claiming 12 to 24 hours of wear prove difficult to remove from carpet fibers and require stronger chemicals for treatment. Combine 1 tablespoon of ammonia with 1 cup of water, and gently blot at the stain with a cloth until it lifts. If the stain remains, dry cleaning solvent or unflavored vodka may help. Wet a white rag with either fluid, just enough to dampen it, and blot the stain until it lifts. If you make little headway, apply the product evenly to the stain with the cloth and wait about 30 minutes before you try blotting again. In some cases, ammonia or a solvent won't be strong enough to dissolve your favorite 24-hour foundation. Apply clear waterproof makeup remover or a white cream-based makeup remover to the stain, and let it sit for 10 minutes. Blot the product off of the carpet, and use the ammonia blend, dry cleaning solvent or vodka to remove any residual pigment. Never apply or pour ammonia or solvent directly on the carpet; always use a cloth. Spilling nail polish on your carpet or favorite rug is akin to spilling paint and requires a similar treatment. Start by dabbing at the stain with pure acetone nail polish remover applied lightly to a white cloth. Focus just on the stain, not the surrounding carpet. Acetone works by dissolving the nail polish in a similar manner as paint thinner dissolves paint, which means the nail polish becomes thinner before it completely lifts. Use a clean corner of the rag dampened with fresh acetone after every two to three blots, so you don't spread the nail polish to other areas when you try to remove makeup from carpet. When you're finish, remove the acetone residue with 1/4 teaspoon of dishwashing detergent mixed with 1 cup of water, followed by a rinsing with clean water. Do not oversaturate the carpet with the acetone; it can dissolve the backing adhesive and cause more problems. 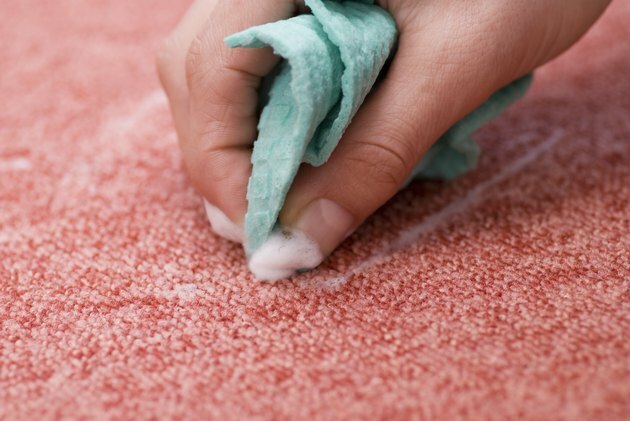 Using the right products and methods helps you remove makeup from carpet without making the stain worse. Know your makeup and what work best with it to tackle stains quickly.